WB - If you are just beginning keep it on Auto. If I am shooting in a consistent lighting situation I will set the white balance myself. If I am in a shooting situation where the light is changing constantly I will keep it on AWB. As you practice shooting in manual you will adjust your settings using the exposure triangle, setting the ISO, shutter speed and aperture. ISO - set to 160, 320, 640, 1250 depending on the amount of light you have available. The lower the ISO the better but don’t be afraid to crank it up if you are in a darker room. I’ve shot many clips at ISO 1250 because my house is dark!! The above ISO’s have lower amounts of grain so stick to them if you can. Aperture – As a beginning you’ll want to shoot at a high aperture, as this will increase your ability of achieving focus (since you will be manually focusing your lens… more on that later). I recommend starting a f|5 or higher. Once you get the hang of it you can shoot at lower apertures to get that creamy bokeh that everyone loves. Shutter Speed - The rule of thumb is to shoot double the frame rate while shooting video. If you are shooting at 24fps then you will want a shutter speed of 50. Rules however are made to be broken, I generally try to stay anywhere at or below 1/250. This makes it easier to switch between stills and video, which I often do. For example, if you are shooting a video of your child walking and then you want to take a photo you can switch back to taking a photo and be able to get a photo without motion blur. Manual Focus - Some of the newer cameras have auto focus available, however many do not. The camera I use (Canon 6D) does not have auto focus for video available, which means that I have to manually focus. I use my Sigma Art 35mm for most of my video work, it has a nice smooth focusing ring. Holding the camera away from your body you will be able to see the screen and then adjust focus by slowly turning the focus ring one way or the other to achieve focus. The more you practice the better! Stance/Movement - When shooting video think STABALIZE! Find a table to set you camera on, lean against the wall, anything that will keep you from getting shaky! 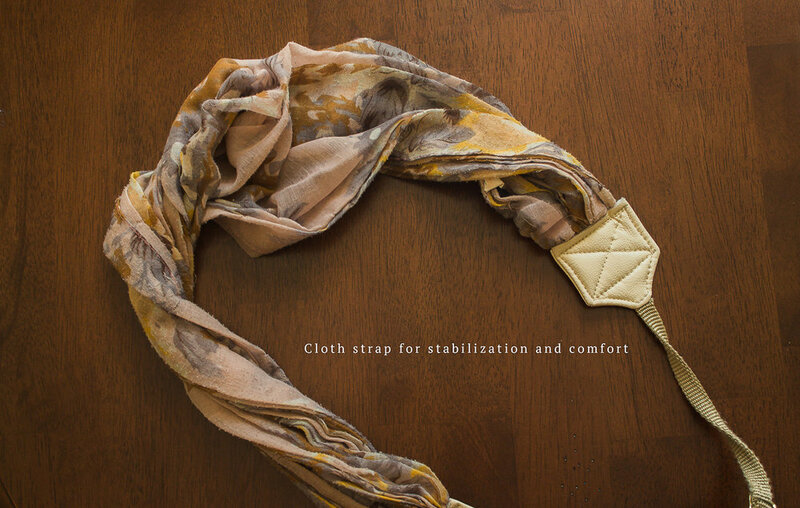 I highly recommend a cloth strap such as the one pictured. Use the strap as means of keeping your camera stable and using slow and steady movement to follow any action, or add movement for interest panning up, down or across the scene. Hold you camera way from your body, making sure the strap is held taut. You can also dig your elbows in at your side to help stabilization. Composition - When shooting video, you will want to take many, many short clips (my clips are anywhere from 3 to 10 seconds long). Just as you compose a scene for photography, think about your composition when shooting video. Approach a scene from a distance, then take mid shots (think from the waist up of your subject), and then close up (don’t forget the details). Getting a variety of shots for each scene will assure that you have enough clips to tie together during your editing. (That’s a post for another day). I hope these tips have you well on your way to shooting video!